The number of people receiving regular Employment Insurance (EI) benefits fell to 435,600 in January, down 9,800 (-2.2%) from December. The majority of provinces had fewer EI beneficiaries in January, most notably Ontario (-5.6%), New Brunswick (-5.4%) and Quebec (-3.6%). There were also declines in Manitoba (-2.1%), Nova Scotia (-1.5%) and Prince Edward Island (-1.5%), while there was little change in Newfoundland and Labrador. In contrast, there were increases in Alberta (+4.3%), Saskatchewan (+2.2%) and British Columbia (+1.6%). On a year-over-year basis, the number of EI beneficiaries in Canada was down 60,100 (-12.1%), with the decrease spread across all provinces. 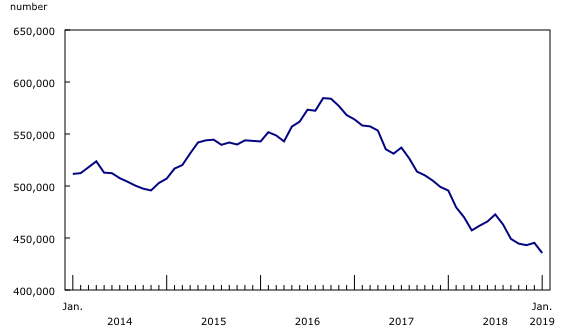 The number of EI recipients in Ontario (107,100) fell for the second consecutive month in January, down 5.6% from December, with the decrease spread across the province. Virtually all of the census metropolitan areas (CMAs) had fewer beneficiaries, with the declines ranging from 3.3% in London to 9.7% in Windsor. In Toronto, the number of EI recipients fell by 4.3% to 39,500 in January. Year over year, Ontario had 16.0% fewer people receiving EI benefits. Over the same period, the unemployment rate in the province was little changed at 5.7% in January, as reported by the Labour Force Survey (LFS). Following four consecutive monthly increases, the number of people receiving EI benefits in New Brunswick fell by 5.4% in January, driven by areas outside the CMAs and census agglomerations (CAs). The monthly decline brought the number of beneficiaries down 5.6% on a year-over-year basis to 29,600. There were 104,400 recipients of regular EI benefits in Quebec in January, down 3.6% from December. 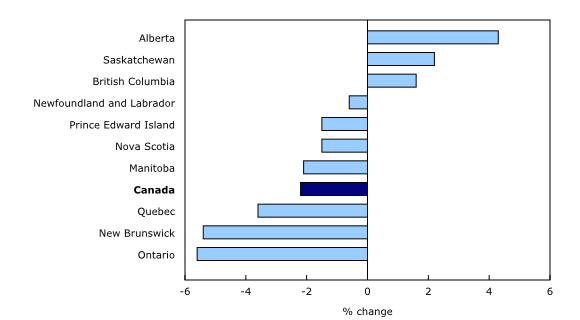 The bulk of the monthly decline was attributable to the CMAs—led by Ottawa–Gatineau (Quebec part) (-8.2%). Year over year, the number of EI recipients in Quebec declined by 10.2%. Manitoba had 15,300 EI beneficiaries in January, down 2.1% from the previous month. Declines were reported throughout the province, with the CMA of Winnipeg (-2.8%) contributing the most to the monthly decrease. Compared with January 2018, the number of people receiving EI benefits in the province declined by 3.8%. Nova Scotia had 26,500 EI recipients in January, down 1.5% from December. The bulk of the decrease was in the areas outside the CMA of Halifax and the CAs. The number of recipients in the province has held steady since the spring of 2018. The number of EI recipients in Prince Edward Island fell by 1.5% to 8,100 in January, partly offsetting an increase the previous month. The decline in January was led by areas outside the CAs. 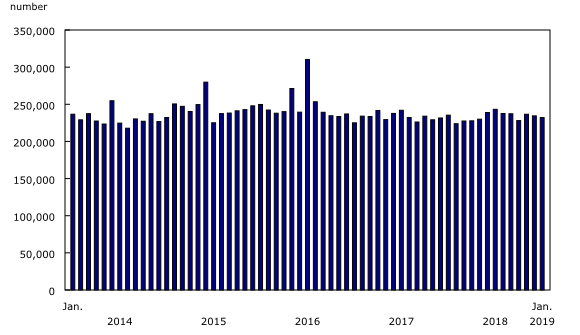 While the number of beneficiaries was down on a year-over-year-basis (-1.0%), it has been trending up since the summer of 2018. In Newfoundland and Labrador, 33,900 people received EI benefits in January, little changed from the previous month. The number of beneficiaries in the province has been trending downward since the summer of 2017, and was down 11.3% compared with January 2018. Over the same period, the unemployment rate in Newfoundland and Labrador fell from 14.2% to 11.4%, according to the LFS. In contrast, Alberta had 50,900 people receiving EI benefits in January, up 4.3% compared with the previous month. Much of the increase was recorded across the CAs (+6.8%) and in the CMA of Calgary (+5.4%). This was the third consecutive monthly increase in the province and coincided with ongoing weakness in the oil industry. This increase was also spread across most occupational groups, notably natural and applied science occupations (+10.9%) and natural resources, agriculture and related production occupations (+9.5%). Despite the recent increases, Alberta had fewer beneficiaries on a year-over-year basis (-19.6%) and LFS data show the province's unemployment rate was little changed compared with 12 months earlier at 6.8%. The number of EI beneficiaries in Saskatchewan rose for the second month in a row, up 2.2% to 16,100 in January. Most of this increase was in the CMA of Saskatoon (+4.3%). On a year-over-year basis, the number of EI recipients in the province decreased by 11.0%. British Columbia had 39,500 EI recipients in January, up 1.6% from December. This was the third consecutive monthly increase in the province and was mostly attributable to the CMA of Kelowna (+7.1%) and the CAs (+3.4%). Compared with January 2018, British Columbia had 14.0% fewer EI beneficiaries. Compared with December, the number of people receiving regular EI benefits in January fell in 5 of the 10 broad occupational groups. The largest monthly decrease was among those who were last employed in manufacturing and utilities occupations (-10.2%), with New Brunswick, Prince Edward Island and Quebec responsible for the bulk of the decline. 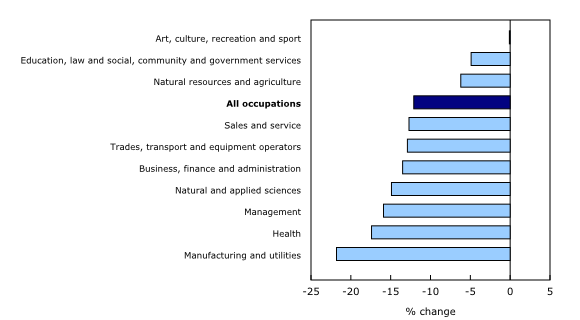 There were also declines in trades, transport and equipment operators and related occupations (-3.9%), natural and applied sciences (-2.5%), health occupations (-2.2%) as well as natural resources, agriculture and related production (-1.0%). At the same time, there were more beneficiaries among those who had last worked in art, culture, recreation and sport occupations (+2.5%), while there was little change in the remaining occupational groups. Compared with January 2018, the number of beneficiaries fell in all broad occupational groups except art, culture, recreation and sport, where it was unchanged. In January, the number of EI claims decreased by 1.0% to 232,100. The number of claims provides an indication of the number of people who could become beneficiaries. The largest percentage decreases in the month were in Newfoundland and Labrador (-6.4%) and New Brunswick (-5.5%). Declines were also observed in Saskatchewan (-2.6%), Quebec (-2.6%) and Nova Scotia (-2.1%). Claims increased in Manitoba (+2.1%) and Ontario (+1.3%). There was little change in Alberta, Prince Edward Island and British Columbia. Compared with January 2018, the number of claims fell by 1.4% at the national level, with the largest decreases in New Brunswick (-5.0%) and Ontario (-4.7%), followed by Quebec (-2.6%), British Columbia (-2.5%), Manitoba (-1.9%) and Nova Scotia (-1.6%). By contrast, claims rose in Alberta (+10.0%), Newfoundland and Labrador (+8.9%), Prince Edward Island (+6.5%) and Saskatchewan (+2.2%). The number of beneficiaries is a measure of all people who received EI benefits from January 13 to 19. This period coincides with the reference week of the LFS. However, claims data are for the entire month. Data on EI for February will be released on April 18. To enquire about the concepts, methods or data quality of this release, contact Lahouaria Yssaad (613-951-0627; lahouaria.yssaad@canada.ca ), Labour Statistics Division.